Caught behind Richard Sherman talking and Marshawn Lynch not talking, plus Peyton Manning’s legacy along with Broncos’ defensive backs contemplating fake retirement, we have lost sight of perhaps Super Bowl Sunday’s biggest star… Russell Wilson. Where would the Seattle Seahawks be without the second-year quarterback? Possibly caught behind Matt Flynn’s arm that has already been released by two other teams since being traded (Raiders and Bills). I am quite sure head coach Pete Carroll has enjoyed Wilson’s company. A poll taken by 320 anonymous players has Carroll the coach most players would like to play for. That comes from his success and liveliness on the sidelines. Since picking Wilson with the 75th pick of the 2012 NFL Draft, the Seashawks have been in back-to-back postseasons — this year leading to Super Bowl XLVIII. 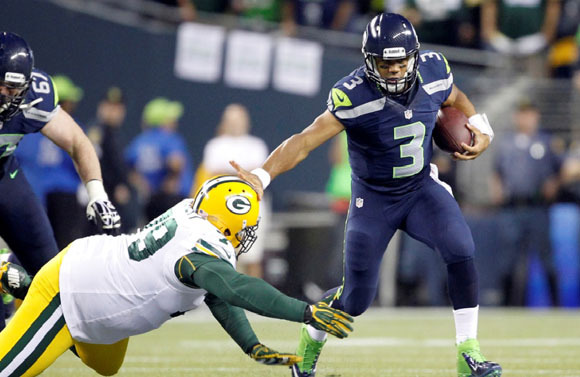 Wilson’s stats on paper may not impress, just 26-touchdowns and 3,357 yards passing. However, Wilson has retained a rating of 101.2 which was ranked seventh in the NFL according to ProFootballFocus.com. Three of the six men ahead of Wilson are Super Bowl winning quarterbacks (Drew Brees, Peyton Manning, Aaron Rodgers). Wilson is most dangerous when on the run. Not so much running the football, but throwing the ball on the run. For example, in the conference championship against the San Francisco 49ers, a 35-yard pass to Jermaine Kearse was put on a dime for a lead-changing touchdown. Needless to say, every time Wilson is put under the pressure, the 5’11” quarterback comes through nine out of ten times. Although he is forgotten among all the other stars in this Super Bowl, Wilson may be the biggest one when the game is over.